From Nana's Kitchen: I Challenge Myself to a Weekend Bake-Off! I Challenge Myself to a Weekend Bake-Off! Okay, my next “Neat Little Christmas Find” is…. The Be Merry Dining Collection. It’s already out of stock online, so I dropped into a local Target and picked up 6 pieces. 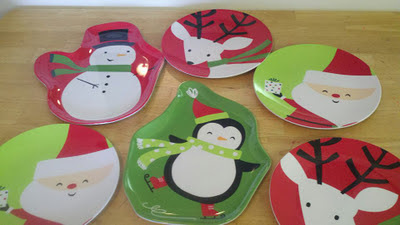 I came home with 2 great big trays for the cookies I haven’t baked yet, and 4 smaller plates, each graced with pictures of ice skating penguins, Rudolf, Frosty and Santa; their squeaky clean surfaces challenged me to a weekend bakeoff. I’m still not entirely sure which cookies & bars I’ll give as gifts this year—what I do know is that their home is going to be under saran wrap on these plates. I’ll check in with the Nana Network after the weekend with photos and direct links to the recipes I decided on. Right now my mind is a whir of rolled oats, dried cranberries, chocolate chips and peanut butter chunks. As good as this sounds with a creamy white glass of 2%, I do have a confession to make… I bought some “peel and bakes” to round out these cookie platters. Because I chose Tollhouse, there will be plenty of Box Tops for Education to snip and send to my grandkids’ school. I bought sprinkles (red and green of course!) and snowmen and reindeer shaped cookie cutters that we’ll have so much fun plunging into the rolled out dough…it’s pretty gratifying, actually, that I’ll be helping my grandchildren create 6 gifts in all with materials under $50. Not that giving away holiday cookies as presents is anything new—I just think breaking away from the tins with the lids, and giving everyone a good peak through the see-through wrapping is a nice change. My favorite charity sent adhesive gift tags in the mail to wrap from the bottom and secure at the top. I hope my cookie recipients wash the cookie platters down with a good glass of eggnog or coffee!